The winter season is the time for rest, sleep, and for some fur folks it is the time to go into the rainbow of love, to go “home”. Energetically speaking, it is the time for many to complete their time here on earth and go home to total love and being. Winter is the time when crossing over and going home is easy for those fur loves who have given their purpose here with us to the very max. They DO remain in our hearts and touch and send messages to us from even a bigger space than just sitting beside us. 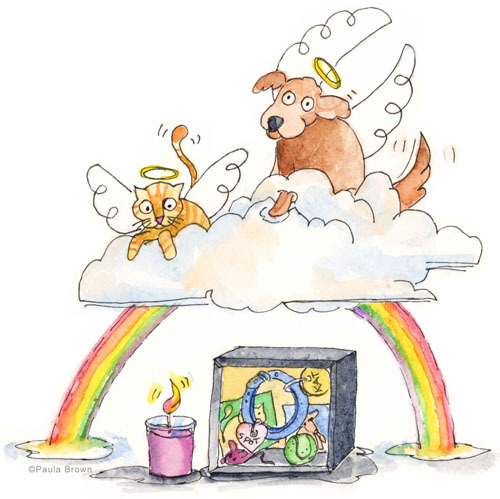 Having the privilege of loving many fur folks who have crossed over “The Rainbow Bridge”…I know well the deep longing to have them here with me in the physical to enjoy, love, and laugh with. I also know that when an animal needs to leave this earth, they are totally accepting of this time and leave with grace the bodies that just “do not work” for them any longer. Being an animal communicator, I experience both the sorrow of saying our goodbyes as well as the joys of knowing that our fur folks are always living in our hearts…always giving us their love even if we cannot touch or see their twinkly eyes and funny expressions. Believe me, they send their love and messages 24 / 7 from their new home and want us to find happiness and love after they pass. When someone mentions “closure” to me as they wish to talk with their passed away animals I do understand this need…I just know there must be a better word for saying goodbye since in my knowing there is never really a “closed door” as an animal passes. There is always an open door for them to communicate, love, and guide their people. It is with this purpose that I am jotting some notes down to let you know they are still “talking” to you after they leave this earth. Unconditional love NEVER leaves; it is always there, always working through us and with us. This is a fur folk’s legacy to us all…unconditional love along with the purpose and teachings that are extremely personal to each and every one of us. There is no “closure”, there is only love…love is always “open”. AND, you can connect up with their love at any time, they continue to speak and support in amazing ways. It is magical! During this end of the year time, when things do sleep their deep sleep, when there are many finding rainbows to guide them home…think of the love that is always there, knocking at your heart’s door that will knit together broken hearts of their leaving. They have not left; they are just “home” bathed in beautiful rainbows of love! This entry was posted in Blog Archives, Recent Posts and tagged Messages from Rainbows. by Paula Brown. Bookmark the permalink.